Most of the time, I do not need a mixer with my setup. However, on that rare occasion when I do, there was never a neat, accessible place to set it up. I had a few hours off last week and put this together. Thought I would share it with the good folks visiting the PSR Tutorial. The rack is constructed from a piece of 1/8-inch thick aluminum plate that was purchased from a local welding shop. The shop also bent a 1-inch lip at the bottom and a 30-degree bend was made 10-1/2 inches above the lip. I then cut a 3/4-inch wide slot in the upper end of the plate that was an 1/8-inch longer than the rubber keyboard pads. This alows the keyboard to continue to rest on the rubber pads with the platform in place. 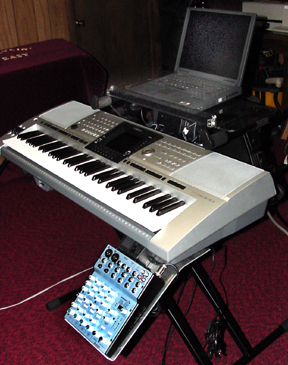 On the bottom of the platform is a 1-inch strip of 1/8-inch aluminum that slips beneath the keyboard stand's support arm to provent the mixer platform from moving. The place is covered with a thin layer of black rubber to prevent abrasion to the keyboard stand. The end result is a solid platform that's easily accessible, yet out of the audience's sight. I also made another laptop platform for the the 2-tier X-stand as well. It contains a surge protected power strip, the power supply for the keyboard and laptop, and there is a 20-inch strip light on the front side that illuminated the keyboard with a soft lite that's real handy when performing in subdued light situations. There is an on/off switch in the light's power cord so it can be turned off when it's not needed. All of the cables are either cut to length, or coiled in such a manner that they're inside the three-sided laptop box. P.S. The mixer is an Alesis Multi-Mix 6-FX. It has lots of great features, it's compact, and only cost $100. This page updated on March 22, 2019 .